Hearthstone is a game for haters. It’s expensive; its metagame stands still for months; no matter how well you play, you will drop games to bad players with good luck. Read the comments on pretty much any article about Blizzard Entertainment’s wildly successful collectible card game, and you’ll find a glut of testimonials from disgruntled ex-players who quit because they think the game got too random. People who ostensibly love the game will often undermine their own expertise by calling Hearthstone a “children’s card game.” Literal professionals will attribute their tournament victories to random number generators (RNG) instead of skill. After losing at last month’s Hearthstone World Championships in Amsterdam, the analyst-favored pro player Alexandr “Kolento” Malsh asserted that “sometimes playing well is not enough.” As someone who’s played the game for four years, I can confirm that that sounds about right. “I don’t think anyone can come into Hearthstone and want the better player to win every single time, because that’s just not gonna happen,” says Muzahidul “Muzzy” Islam, a top Hearthstone player who won the Hearthstone Americas Spring title but lost out in the early rounds of the World Championship. “It’s a card game, and it’s draw-based. If you’re complaining about the RNG aspect in Hearthstone, then why are you still playing?” If Hearthstone is really just a series of coin-flips, as the harshest critics say it is, then there’s no skill to display, and no reason to watch a pro game over any given low-rank match. Are there professional slot players? If there were, would anyone enjoy watching them? For the uninitiated, Hearthstone is a digital collectible card game where players gain an increasing amount of mana each turn, then use that mana to play spells and creatures in an attempt to kill the opponent. The concept is simple, but doing well in Hearthstone requires encyclopedic knowledge of the cards and decks that are popular in the metagame at a given moment. One classic example: if your opponent is playing a Mage deck, the wise player will try not to play minions with low health before turn 7, because the Mage can kill them all with a 7-mana card called Flamestrike. Of course, the ability to play around cards requires knowledge of what those cards are, and a good chunk of skill in Hearthstone is about playing to your own win condition while determining and avoiding the opponent’s. Regardless of how much time you devote to learning enemy decks and mastering your own, though, there’s no changing the fact that luck and probability color nearly every decision in Hearthstone. Do you keep that late-game card in your starting hand, or do you toss it back into your deck in the hopes of drawing it at a more opportune moment? If you see that you’re against a Druid, do you play the match slowly in hopes that it’s a lategame-oriented Jade Druid, or do you try to build an early board presence in the hopes that they’re running a more aggressive deck? The ability to tweak strategies based on your odds and the situation at hand, Brode tells me, is one of the main skills that Hearthstone’s random elements attempt to test for. But even Brode, the game director, acknowledges that some older cards like Ragnaros the Firelord—which deals 8 damage to a random enemy at the end of the turn—introduced luck in a way that often felt ridiculous. The card wasn’t impossible to counter, but its effect often left the outcome of a game up to an end-of-turn coin flip that neither player could control: if Ragnaros hit the enemy minion, the opponent would live to see another turn. If it hit the enemy’s life points, the game would be over. Now that Ragnaros is no longer included in Hearthstone’s Standard mode of competitive play, Brode says the team has learned its lesson, and is trying to create “randomness that allows skill to happen after the random event.” Post-Ragnaros, Hearthstone is no less random than it used to be, but the randomness feels like something that allows skilled players to respond rather than the primary driver of events. This attempt to create a sort of “fair randomness” is a common theme in Hearthstone balancing, and it’s probably best demonstrated with cards like the “Unidentified” set from the recent Kobolds and Catacombs expansion. Each Unidentified card comes with one primary effect, like Unidentified Elixir’s “Give a minion +2/+2.” When drawn from the deck, however, the card gains one of four additional bonuses at random. The Elixir of Shadows will summon a 1-attack 1-health copy of whatever minion you use it on, the Elixir of Hope will return a minion to your hand once it dies, and so on. The bonus you receive is arbitrary, but the player’s ability to deploy the randomized effect is really what determines the outcome. Regardless, “randomness that allows skill to happen” is still randomness, and that bugs the crap out of a large portion of the Hearthstone playerbase. Players like former world champion James “Firebat” Kostesich believe that as it currently stands, the outcome of a given Hearthstone game too often boils down to whether a player draws a very specific card at the start of the game, from a deck-countering “tech” card like Skulking Geist, or a powerful early game Legendary minion like Prince Keleseth, which buffs every other minion in your deck and can be played as early as turn 1. For a certain subset of the Hearthstone-playing audience that thinks like Kostesich and Koy, it doesn’t actually matter where the ticker sits on the sliding scale from luck to skill—any perceived presence of luck disqualifies it as a good esport. One of the most popular Hearthstone memes is to spam “ESPORTS” in Twitch chat or a comment section in the aftermath of a lucky play. By conventional understanding, esports shouldn’t have moments like these: the better person should always be able to win in a 1v1, the loser should have to “git gud,” and one person should always be demonstrably better than another. Of course, this is a ridiculous oversimplification. Even the most skill-based games and sports involve some randomness; they involve humans, and exist in the universe. LeBron James and Kevin Durant might both be small forwards, but LeBron is a bulkier dude who plays to his explosive strength, while Durant plays a more agile game and takes greater advantage of his length. This is not revolutionary analysis: in competitive settings, players use their specific strengths to create distinct play styles. In Hearthstone, those style differences play out something like this: some players, like Jeffrey “Trump” Shih, specialize in maximizing the value they get out of each card. Others, like Firebat, play with a more aggressive style and focus on killing the enemy as quickly as possible. Not everyone will agree with Muzzy’s outlook. Brode, for one, argues that Hearthstone is fun to watch because there’s not an optimal decision to make for every turn. 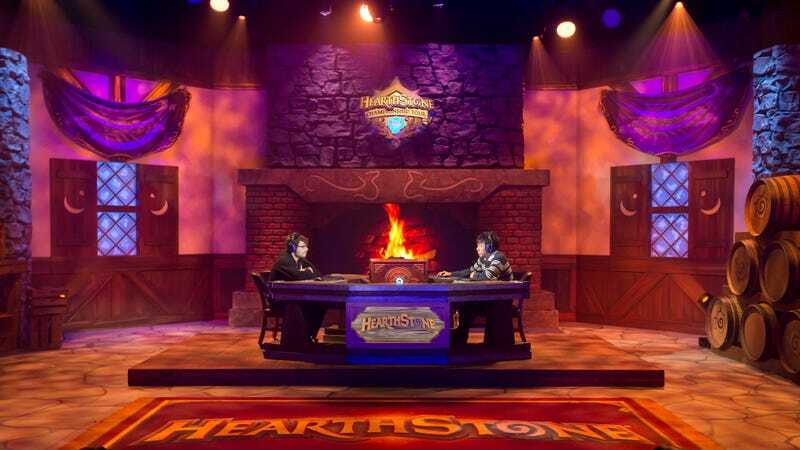 But Muzzy’s moneyball approach toward the game hints at the baseline skill required to succeed in Hearthstone that might not be readily apparent for most tournament viewers. One of the biggest determinants of who will win a tourney, for instance, is who can bring the best set of decks. This is a complex game in and of itself: since each player brings multiple decks to a tourney and can ban one of the opponent’s before a match, there’s a major challenge in trying to predict what decks are going to be popular, then bringing the right decks to counter them while keeping that ban ability in mind. If I think a specific powerful Warlock deck is going to be played by everyone in the tournament, I might decide not to bring a deck that counters it, instead opting to ban it and then bring decks that are strong against the other popular decks. Since every player is trying to optimize their own deck lineups, the tournament deck-building metagame is a sort of three-dimensional rock-paper-scissors, and can play a major role in who wins or loses. Then there’s the matter of actually playing the games. Every player in a Hearthstone tournament needs the ability to absorb vast amounts of information on the fly. While most players use third-party deck tracking software in casual play to remember what cards they’ve played and what outs are still available to them, that’s not permitted in a tournament setting. On top of that, players need to get a feel for what cards their opponents are running. In “open decklist” tournaments, where players can see all their opponent’s cards before playing against them, every player needs to know the intricacies of the opposing decks so that they can best play around what they’re running. At the elite level, there’s one Hearthstone talent that trumps all the rest: consistency. Because match-by-match outcomes can often be so volatile, the game’s esports scene functions as a numbers game where sample size and sustained performance trumps clutch all-or-nothing playmaking. In that way, it’s more like baseball, where the best teams hover around a 60 percent win rate over the course of 162 games, than a sport like football where a single-elimination tournament selects the best team. Unlike football or even baseball, Hearthstone games only take a few minutes each, and require little physical exertion. To qualify for the big tournaments, top players need to play hundreds or even thousands of games across online ranked play and regional tournaments. To dedicate a sufficient amount of time to the game, Muzzy tells me he recently put college on hold, and when he’s not playing the game, he’s either traveling to tournaments or watching recordings of other pro games to critique and learn and improve. To some, the strain of playing Hearthstone every day for hours on end can lead to burnout: last summer, the pro player Cong “Strifecro” Shu had to take a few weeks off just to get his mental state back on track in the days leading up to a new expansion. Once you see how much preparation goes into competitive Hearthstone, it’s easy to see why a series of unlucky draws and bad beats might destroy a player’s faith in the game. The fact that skill only yields results over time makes Hearthstone a battle of mental attrition just as much as intellectual prowess, and it sharpens the sting of luck-based factors. Early in 2017, after consistently reaching Hearthstone’s highest ranks as a casual player, Julien “Docpwn” Bachand received an email from Blizzard saying that he’d qualified to compete in a Hearthstone Championship Tour tournament. At the time, he knew nothing about the competitive Hearthstone scene, and said in an interview that he “didn’t even know there was a tournament.” Less than a year later, Bachand is a top-tier player who competed in the Hearthstone World Championship earlier this year. Skill vs. luck might drive Hearthstone heads and pros crazy, but that’s only one side of the competitive Hearthstone scene. A story like Bachand’s might come off as unfair to another pro player who has spent more time grinding out tourneys, but that has obvious narrative appeal. If the best player doesn’t always win and in fact relative newcomers can stand toe-to-toe with established pros, that’s a hell of a marketable product, and rare in esports. Some games and sports just have chance as a permanent feature, and that can alter individuals’ futures in wild ways. As a random example, take Guy To Remember Gary Matthews, Jr. For the first five years of his career, the outfielder was a mostly solid defender and journeyman streaky power hitter, bouncing around between six franchises and averaging $1.2 million dollars in salary a year. Then in 2006, he hit .343 on balls in play (BABIP)—a figure that can wildly fluctuate for little rhyme or reason but has a huge affect on a hitter’s productivity. That was enough for the Angels to sign him to a five-year, $50 million contract that offseason. He promptly reverted to his pre-2006 production levels the next year. The metagame might look intimidating to new players who don’t follow it closely, but the announcers take time to explain each decision, and since each turn plays out over the course of a few minutes, the casual viewer is never subjected to information or knowledge that they’re not already familiar with. All told, Hearthstone is pretty accessible to outsiders by esports standards. The never-ending controversy about what constitutes a bona fide “sport” has, throughout the history of competition, been both exhausting and impossible to solve. As long as there are games that don’t fit neatly into pre-established genres, there will always be gatekeepers who will dismiss those games based on those criteria. That’s not to say Hearthstone is some kind of genre-busting, rebellious work—it’s just that there’s little or no value in looking at the game through the restrictive lens of what should define an esport. Hearthstone is not the game to watch or play if you want the most skilled player to win every single time—it’s a laid-back experience in which the best shine, sometimes, and always get a chance to flash their personalities. Sometimes your favorites catch a lucky break, and sometimes they don’t. But it’s that gap between who should win on paper and who wins that makes Hearthstone such a compelling game to play and watch. Can gamers accept that sometimes it’s more exciting to believe that anyone can win than to assume that the better player always will?